This is a Cryptolocker variant that has propagation routines, enabling it to easily spread to other systems. The said routine is important since other CRILOCK variants do not exhibit the same behavior. This worm arrives via removable drives. It deletes all .EXE files found on removable drives and replace it with its copy using the names of the existing .EXE files. 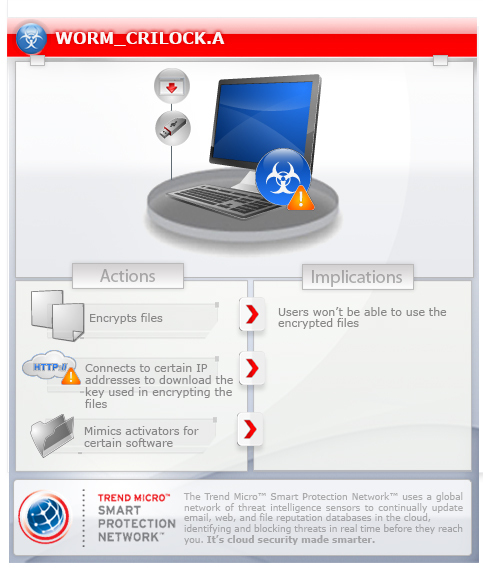 Restart in normal mode and scan your computer with your Trend Micro product for files detected as WORM_CRILOCK.A. If the detected files have already been cleaned, deleted, or quarantined by your Trend Micro product, no further step is required. You may opt to simply delete the quarantined files. Please check this Knowledge Base page for more information.